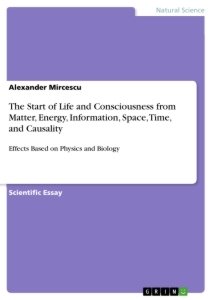 The present text focuses on the start of life and consciousness based on factors such as matter, energy, information, space, time, and causality. Physics possesses four levels. The first level is the simplest physical level but offers the highest flexibility, since matter, energy, information, space, time, and causality are entirely decoupled. This sets the stage for the biological systems and processes defined by three stages: the chemical evolution, the self-organisation of molecules, and the biological evolution. We see that the higher physical level is, the stronger the couplings between matter, energy, information, space, time, and causality become. These couplings guarantee that the universe gets a stable structure and functionality by its elementary particles. Living systems perform evolution processes leading to constantly improving new living systems, as already depicted by Darwin in the evolution of the species. The action of a new living system, such that said living system is creating new causal relationships between the information pieces of itself and other living systems until death shall be defined as consciousness. Since biological processes are based on matter (as defined by momenta and angular momenta), energy, and information, the conservation laws for momenta, angular momenta, energy, and information also apply for biological systems. Fuels' Paradise - How can Chemistry find a way out of the energy crisis?